We have seen that, in a PLA logic both the AND and OR arrays are programmable. Further, the programmable switches has two difficulties for manufacturing that are, 1) . PLA are hard to fabricate and 2) PLA reduces the speed-performance of circuits. Thus, new architecture AND array is programmable and OR array fixed is developed as shown in figure. This device is known as programmable array logic (PAL) device. Since PALs are easily manufacturable and less expensive, PALs are popular in practical applications. 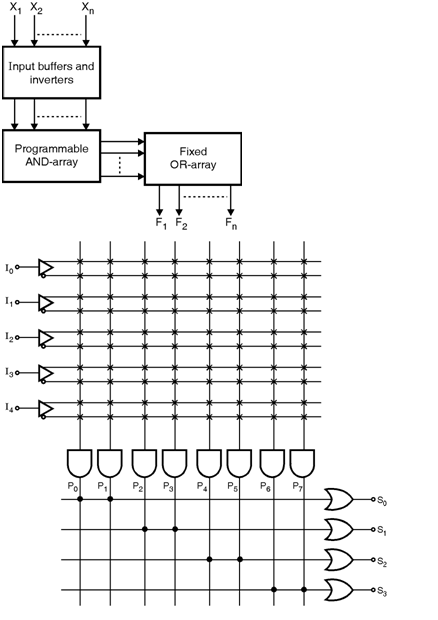 A most commonly used type of PLD is programmable array logic (PAL). Figure shows the configuration of AND and OR arrays for a PAL with 5 inputs, 8 programmable AND gates and 4 fixed OR gates. The AND gate has 10 inputs with fuses which can be programmed to generate 8 product terms. The number of fuses in a PAL are the product of 2M and n, where M is the number of input and n is the number of product terms.